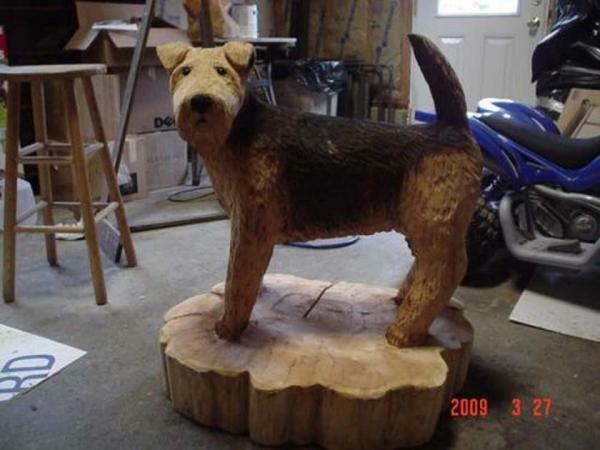 Here is an airdale dog that a client commissioned Eric to carve. It was a lot of fun. 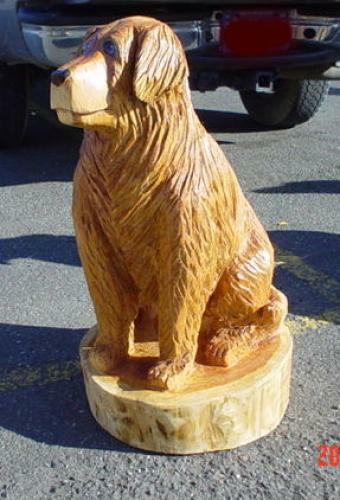 A client who had lost her beloved golden labrador asked Eric if she supplied the picture, would he be able to create for her a chainsaw-carved representation of her pet. Eric had never carved a dog, much less one that had such nostalgia attached to it, but he said he would do his best. When he finished and showed the sculpture to the client, she was absolutely amazed at how much the carving looked like her dog. Eric was honored with the faith the client had in him, and in the end her happiness was proof positive that he had achieved the desired likeness.